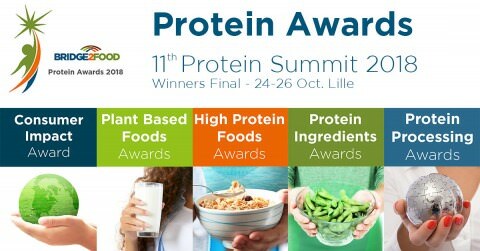 Meet Ruland at the protein summit in Lille, France from 24. – 26.10.2018. Experts will inform on the latest developments in the growing protein market. Learn more about the availability of proteins, the impact on food security, economy and protein production. 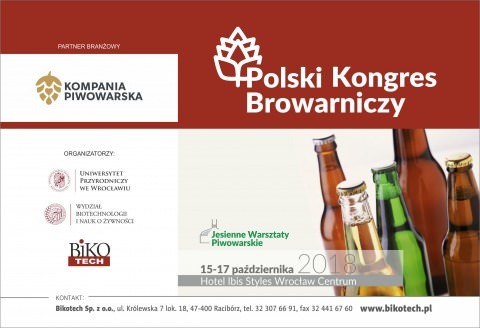 Our focus during this event will be to get more details about the needs in the processing of proteins in any field of application and show our solutions in processing of proteins and proteinhydrolysates. For more information on the protein platform, please see the Protein Summit website. 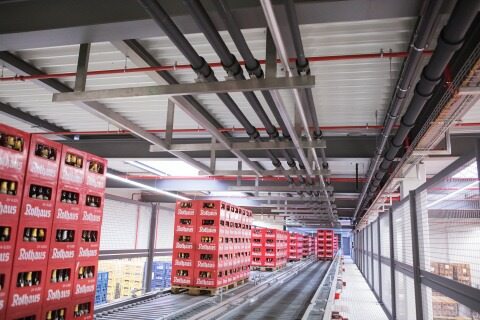 In February, the Badische Staatsbrauerei Rothaus AG inaugurated their new filling line and bottle sorting system. Ruland supported our longtime customer Rothaus with the piping for the two units. Since the BASF Personal Care & Nutrition has used the Whirlwind technology to clear the pipes, they have not only improved the yield but also minimised the time for product changes. Learn more on the project on cleaning of pipes. The 34th of Fispal Tecnologia in Sao Paulo has just come to an end. Ruland Tychy and their Brazilian business partners Ricefer and Proiectus were among the 440 international exhibitors. Our booth with the powder dissolving system was very popular among visitors. The number of visitors shows the continuous development of the food and beverage industry in South America and the high demand for technologies provided by our company. Once again, Fispal Tecnologia has given us the opportunity to share knowledge, experiences, information and to learn more about the demands of the customers in that market. The trade fair confirmed our conviction that the potential of the South American companies is huge and that we’re looking forward to upcoming projects. We are approaching the 34th edition of the Fispal Tecnologia International Fair, held in Sao Paulo, Brazil. The significance of this event, considered to be the most important and the largest industry event in Latin America, means that Ruland Engineering & Consulting cannot miss the opportunity to attend. 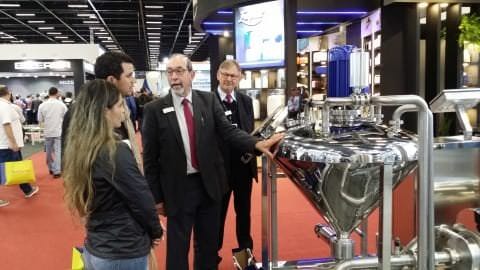 The visitors of Fispal Tecnologia will have the opportunity to see the latest trends, innovations and concepts for the machines used in the food industry. Our business, related to the supply of modern process technologies for liquids, fits perfectly into the character of this event. Together with our partner – Ricefer, a tank supplier – we would like to invite you to our booth H160, where we will be presenting one of the many solutions dedicated to the food industry – the powders dissolving system. Big success in the first quater of the year for Ruland Tychy. Ruland Engineering & Consulting Sp. Z oo z o.o. 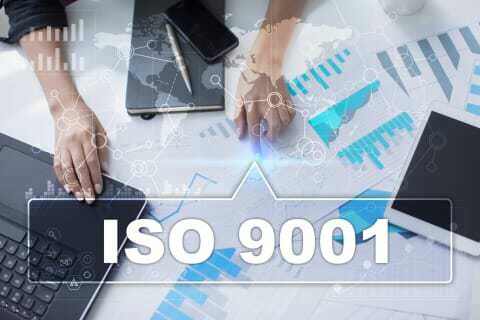 completed successfully their first direct audit, and has been certified according the the new norm PN-EN ISO 9001: 2015. From June 11th – 15th the leading show for process technology will take place in Frankfurt. Please visit us at Hall 4.0, booth H24. 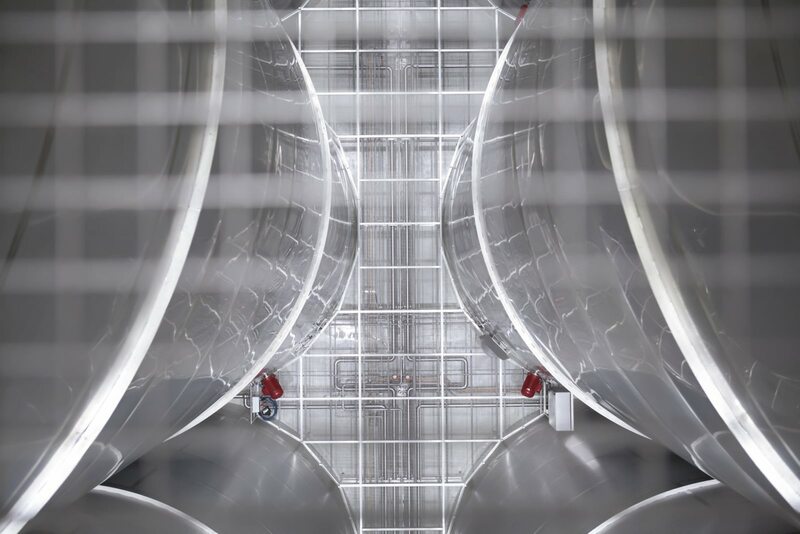 Learn more about the flexibility of our process systems. 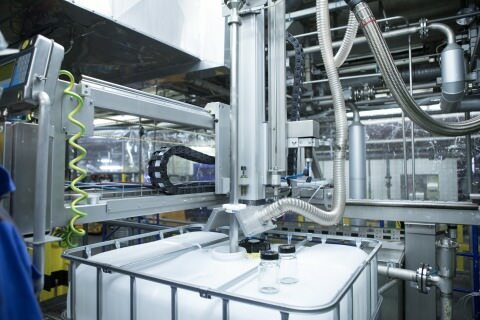 Prof. Dr. Löwe at the Johannes Gutenberg University in Mainz developed a promising method for the manufacture of ionic liquids. 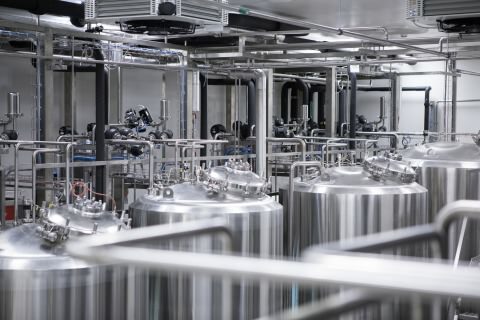 Ionic liquids are said to be the environmentally-friendly alternative to the common chemicals that are used at the manufacturing processes at chemical companies, the paper and fibre industry, the petrochemestry and many others. 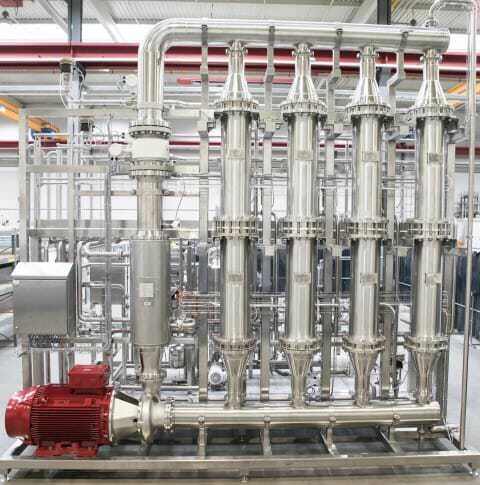 Together with Tulicon, Ruland took over the scale-up of the method for the industrial production of ionic liquids. 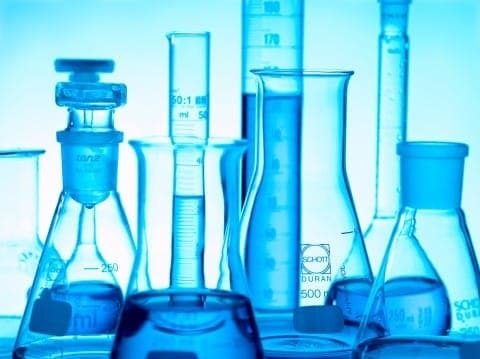 Read more at our report Ionic Liquids. Use and processing of animal and plant proteins and protein hydrolysates vary a lot. Thus, there a many process systems and engineering solutions for the production of proteins and protein hydrolysates. Read more on protein hydrolysates. Please visit Ruland at the trade fair for the food- and beverage industry. The slogan of the trade fair is: “All for one. 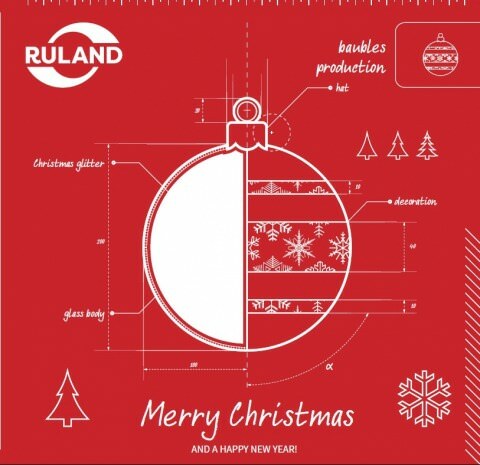 All in one.” A slogan that also fits perfectly to Ruland, because we produce customized all-in-one solutions for process technologies for liquid products. Visit Ruland at the exhibition for drinks and liquid food industries. 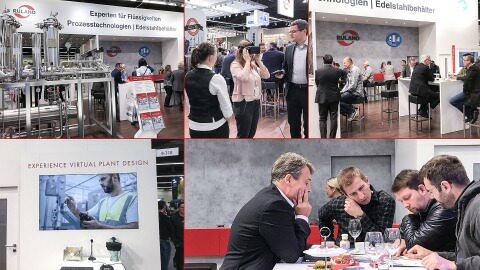 The organizer of the exhibition says: “The exhibitors of drinktec have a solution for every use”. At our Ruland booth we show our special solutions in process technology for soft drinks, drinks, water, food and other liquids with the help of a virtual process unit. Last saturday, we had our annual summer party at our head office in Neustadt. Starting in the afternoon, our staff and their families had a magic moment with Alessandro, the magician. 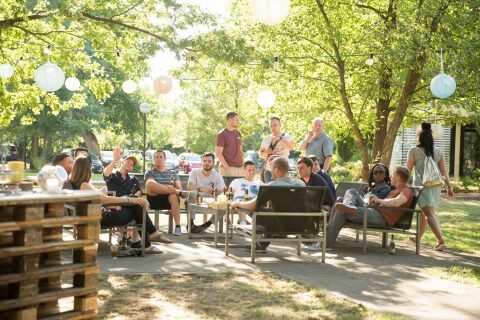 At summer temperatures our company site with its old trees, party tent and the terrasse was the perfect place to be. After dinner, we continued with the band Tufftones and in our cocktail lounge. Our colleagues partied till late after midnight. Thank you for this wonderful summer party! Students in automatisation technology got an inside in the every-day engineering of process equipment. The senior class of automation of Meisterschule Kaiserslautern visited Ruland to learn more about the design of automatisation solutions. With various presentations on plant design and construction, sustainable plant cleaning and predictive maintenance, we gave them an idea of our daily work. The future automation specialists were very interested in our customer-oriented project management and the programming of ongoing projects. Ruland designed a concept for producer of pharmaceuticals and cometics for their tank farm for hazardous materials. Special focus was on quality and safety. To find out more on the basic design for this tank farm with CIP system built on EHEDG regulations, please see our consulting report “new tank farm”. For a project to be realised in the USA, Ruland built 10 single to four row load and control cabinets. The 49 on-site control boxes were also done in our in-house workshop. The German TÜV certified that our technicians contructed and build all control and load cabinets in accordance to the safety regulations of the UL 508 A. The UL certification helps our customer to fulfill the official regulations on electrical devices. It’s also an element to continuous quality of the production process. All control and load cabinets are on their way to the United States. 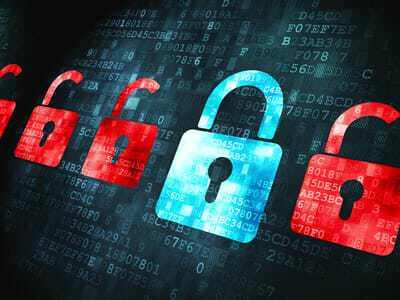 According to the media, Trojan horses, that encrypt hard disks completely, already caused significant financial damages. One click on excel-lists, word-documents, PDF-files, ZIP archives and even e-mails with this malware, and you’ll have to pay horrendous amounts of money to decrypt your own hard disk. For this reason, Ruland updated its firewall with a new tool that helps checking documents. Our tip: Check your IT-protective devices! Point out to all users to handle with care and attention e-mails and attachments, especially from unkown users or unsafe websites. 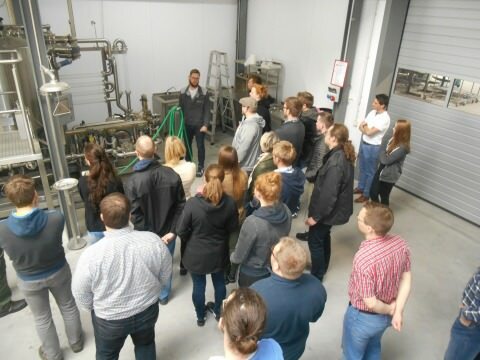 Students of Hochschule Geisenheim University visited Ruland beginning of April. The future beverage technologists wanted to get detailed information on process equipment and our technology for pipe clearing and cleaning. The demonstration on welding and endoscopy gave them an idea of the practical side of plant construction. 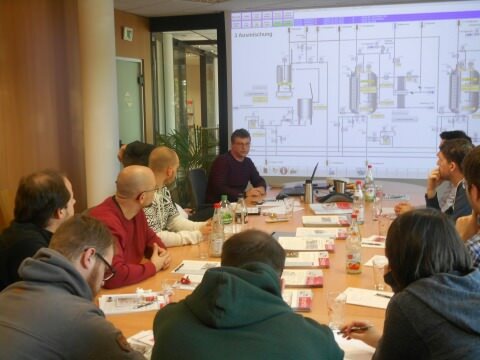 In the presentation on predictive maintenance the students on beverage technology learnt how to keep a process plant fit until a very old age.